Kajiwara's hybrid cookers enable low temperature stewing as well as high temperature cooking for mass production of hand made taste. 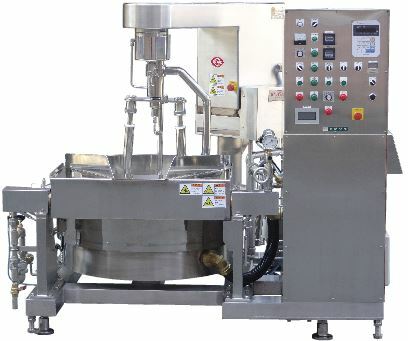 All the stage of processing, from pre-cooking to kneading, are automatically controlled. And neither the bean cages which have so far been used for cooking bean nor hoist to carry around the cages are now required. Thus, the supporting equipment and lobor are substantially curtailed. And also this system ensures 100% yield from material bean and maximum sanitarity. Preserving syrup is 100% consumed in the product without any discharging part which is really economical. And accordingly any filteratoin or recycling process is not required. Roux, Sauce, Saute onion, Seasoning oil, Flour paste, Vegetable/Meat sauté, Bean paste, Tsukudani, Denbu, Kimpira etc. ※Other specifications than specified above are also available. Copyright 1996-2019 KAJIWARA INC. All right reserved.